The summer garden share: You begin paying Keith in May, and you will start receiving your products as they grow. You’re hiring Keith to buy the seeds, plant and grow a garden for you. Results are not immediate and the weather can have an impact in the speed and quantity produced. Some years will be better for corn and other years we will have a bumper crop of tomatoes.There is always the risk of having a bad year but in the 8 years since starting this CSA we have never had a total garden failure. The year-round garden share: You pay Keith an equal amount each month, and you start receiving products right away based on what is still in stock/storage from the previous summer. 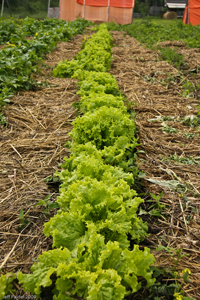 Fresh vegetables, ofcourse, start coming as they mature in the garden. Results are not immediate and the weather can have an impact in the speed and quantity produced. Some years will be better for corn and other years we will have a bumper crop of tomatoes.There is always the risk of having a bad year but in the 8 years since starting this CSA we have never had a total garden failure. After the summer growing season root vegetables are put up in dry storage and others are fresh frozen. You receive of share of this harvest throughout the winter months and, depending on stock, into the spring. For the eggs: Keith buys day old chicks in May, and it takes 24 weeks for them to mature and start laying eggs. This means that in your first year (and only that one year) you will start receiving eggs once your chickens mature (around the end of October). Again, you’ll be paying Keith for buying the chicks and raising them to maturity. After the first year, you’ll always have eggs. 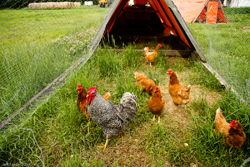 Occasionally issues arise with chickens getting sick or going off their lay. In that situation everyone is rationed. In the opposite case if the chickens are over producing you might get extra eggs or they are made available for sale at $4.00/dozen. purchase over the course of one year. Keith buys the chicks and raises them over the summer – free range and organically fed – until “your chickens” are ready to butcher. Sometimes he has extra chickens in stock and can fill your order early but that is not a guarantee. If there are extra chickens they may also be available to purchase individually but generally Keith only raises what is ordered. For the frozen beef, you get this right away. Keith maintains a herd and he butchers regularlyso he always has beef in stock although he sometimes runs out of certain cuts.